Container gardening isn't just for indoors... or just for indoor plants... or even just for flowering plants... Over the years I've enjoyed all types of gardening and love sharing my experiences and tricks. I hope that you find something that will make your container gardening more enjoyable - and less work / more fun! I've done tomatoes (determinate regular types and indeterminate cherry that I trained), cucumbers (bush varieties as well as a new variety of cold greenhouse cuke that was self-pollinating), muskmelon, sugar baby watermelon, peppers, broccolli, cabbage, radish, lettuces, bush beans (both Henderson Lima and Blue Lake Bush), bush peas, and my favs.. alpine strawberries - all in containers. Here you can see a young Celebrity Tomato plant some dwarf Bib Lettuce, Black Seeded Simpson Lettuce and the little white flowers peeking out from the shadows are Alpine Strawberries. You're limited only by your imagination, your location (light and space) and the containers... Here is a shot of some of the many Alpines that I kept. I LOVE strawberries, especially these (the only thing better is chocolate - but, if you dipped the berries in the chocolate! Oh gosh, time to stop that thought, right now!). 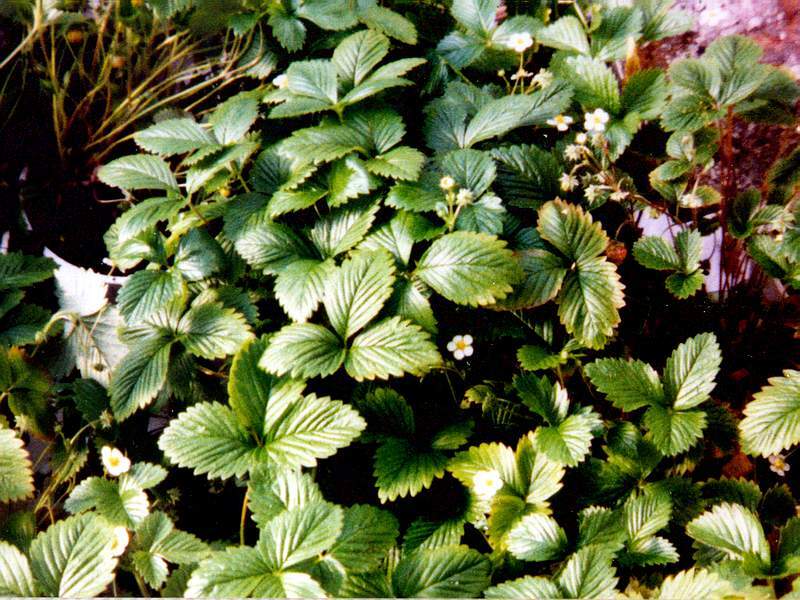 The flavor of the little alpines is just like the wild berries and is so much better than the large commercial types, one taste and you may not be satisfied with the 'jumbo' berries again. They started to set fruit again in January (the low light levels in November and December slowed them down), in fact, if you look really close you can see a single berry that is just starting to ripen. By the end of February I was picking fruit, it was just great! Alpines don't send out runners so they make a nice potted plant. When they get too thick for the pot you split the crowns just as you would an African Violet or Hosta to make more plants. With enough light they will fruit continuously. Even though they are prone to Spider Mites in low humidity I found a slick way to keep them under control. I purchased a bag of Lady Bugs from the garden center store and on top of that I gave the plants a quick bath each week. A mild soap solution using tepid water in a 2 1/2 gallon bucket. Just tip the plants upside down and swish the foliage through the water. The mites don't tolerate the moisture or the soap well at all and it's perfectly safe to use on food producing plants. The lady bugs that got an occasional bath weren't real happy but I'd pluck them out of the water and set them back on a plant and they were none the worse for their little dip! For the plants that I kept in the house I just gave them their weekly rinse, only takes a couple of seconds per plant, and shot them with the mister bottle each morning as I walked around to wake up (I'm not a coffee drinker so my morning stroll to check on the 'kids' was my way of starting my day..... hehehe). They fit nicely on the window sill. Go for all colored bottles, clear ones have a tendency to pick up algae being in the stronger light of the window all the time. Works great for any houseplants or flowering plants that like constant moisture and/or are heavy drinkers. After reading a bunch of stuff on hydroponics a thought hit me. If they can grow Tomatoes on a commercial scale (ie large production levels) in a minimum of space, soilless - or nearly so.... why can't we? What do Tomatoes need to thrive? Light, a place to grow their roots, nutrients, air and water. If they can get the nutrients and water they need, they don't need large soil containers or space. I used a 2 gallon bucket the first time, just 'cause I had one. I buried a 2 liter pop bottle half way in the soil and then planted a Celebrity Tomato. Just 'cause that was the seedling that I had available. It was a tall and healthy plant. I trimmed off all but the top three sets of leaves and planted it deep, covering the newly striped stem (tomatoes will send out new, vigorous roots from the buried stem). Tomatoes need a steady water supply to fruit well, I had that covered with the water bottle. Good soil with compost, peat moss and vermiculite to keep it light and airy with good moisture retention. This plant went crazy. It took a couple of weeks to see good new top growth, it was making new roots, so I expected that. But once those new roots got going, this plant went crazy! Tons of flowers and great fruit set. I used three of those dark green bamboo sticks that you find at the garden stores spaced around the outside of the pot, stuck into the soil - all the way to the bottom of the bucket, and cotton strings zig-zagged between those dowels to give the plant extra support. The strings were mostly hidden by the foliage. I used a light dilution of Miracle Gro with each topping off of the bottle and just let the plant do it's thing. I would change that a bit today, though, I'd lean more toward a compost tea or fish emulsion rather than the artifcial Miracle Grow.. we all live and learn. Today I would do a lot more things more organically. 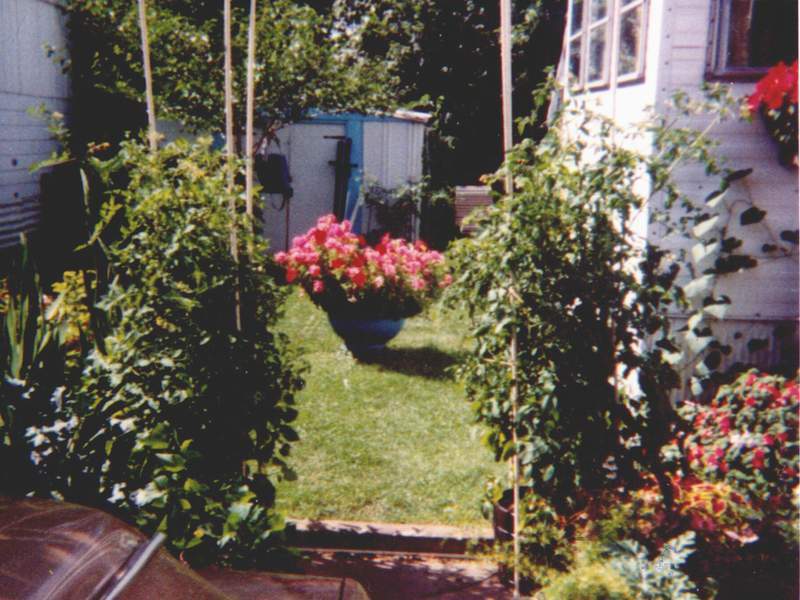 The following year I used two half barrels, rigged them with water bottles, planted three Sweet 100 Cherry Tomato plants in each, used PVC pipe to make an archway and trained the plants up and over the top. It was beautiful! Produced literally thousands of fruit and all I had to do was top off the bottles every other day and pick all the goodies! hehehehe You can see them in the photo, just about 4 feet tall at this stage. I've also used this same basic concept using hanging baskets and cherry tomatoes. The plants were healthy and great producers, trailing all the way to the floor. AND really pretty! If you'd like to learn more about pop bottle waterers, check out the link above - Easy Watering - to learn how to set up your own. 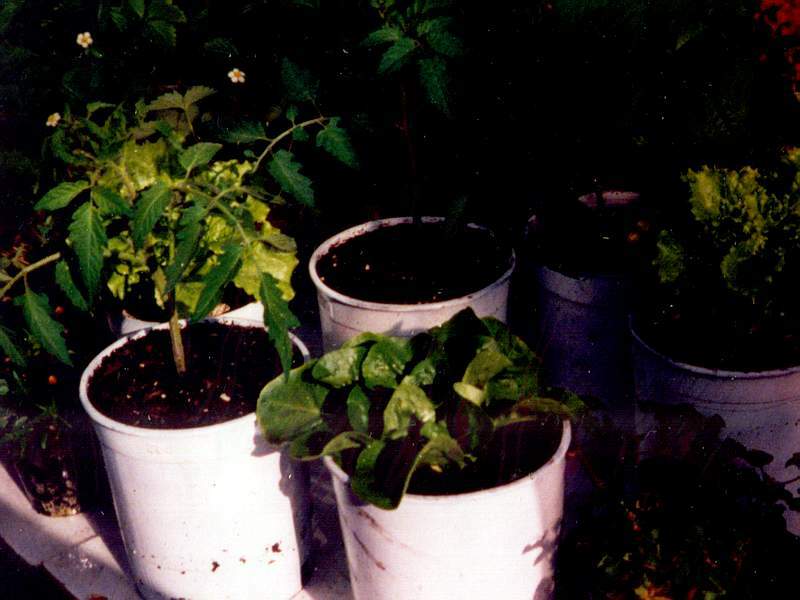 Here's a shot of the container garden that we had on the deck last summer (2002). The containers are on a cart that allow us to move it into the house over night extending the growing season for many weeks. We had six Better Boy Hybrid Indeterminates on the cart (two are sharing one of the larger pots). This photo was taken in late June, by mid July the plants had more than doubled in size. I added additional cages above the first sets to allow for the increased height. Winter hit us earlier than usual last year and we had extended periods of frost. With the days holding below freezing so early in the season we made the decision to pull the plants, but we did manage to get a few dozen green fruits picked. Those green fruits continued to ripen all the way up to Thanksgiving.. what a treat! Even with the record high temps we had here in Minnesota last summer the plants were consistently setting fruit. They took a LOT of water though. In addition to the bottle waterers each pot took nearly a gallon of water daily during the really hot weather. It got to be a challenge guessing when they needed to be fertilized because of the heavy watering. I watered twice a day, around 7 or 8 in the morning and again in mid afternoon. But, thanks to those bottles, the plants didn't wilt once.. not even on our hottest days!